Considered to be one of the finest examples of architecture in Rajasthan, the Ranakpur Temple complex stands on a plinth in a remote and beautiful valley. It is the destination for one of the five major pilgrimages of Jainism, an Indian religion whose followers practise non-violence towards all living beings and believe that self-control is the key to liberation. In the 15th century, a Jain pilgrim called Dharanashah was inspired by a dream to build a temple to Adinath, the 'First Lord' of the Jain theology. In his dream, he saw a temple building that resembled a 'Vimana', a mythological flying palace that appears in Jain texts. After rejecting plans from many architects, Dharanashah chose the plan submitted by an artist called Deepaka. The construction of the temple began in 1439 and it took around 50 years to complete. The principal idols had been installed earlier as Dharanashah feared he would die before the building work was finished. 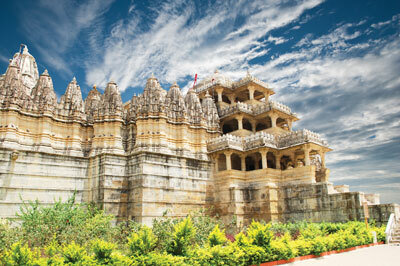 The nearby village of Ranakpur was constructed at the same time as the temple, all on land donated by King Kumbha Rana. The temple is wholly constructed from light-coloured marble and covers an area of 4,460 square metres. It is a three-storey building and has four faces with four entrances, symbolising the conquest of the four 'cardinal directions'. In the main chamber there are four huge white marble statues of Bhagvan Adinath, facing in four different directions. These images are surrounded by many smaller shrines and domes. A range of cells with separate roofs encircles these shrines and domes. Five spires elevate above the walls and around 20 cupolas rise from the roof of the pillared hall. Each spire houses a shrine and the largest shrine is the important one that addresses the central altar. The temple ceilings are festooned with foliate scrollwork and geometric patterns. Altogether there are 24 pillared halls with 80 domes supported by 400 columns. The upper and lower parts of the domes are linked by brackets decorated with intricately carved sculptures of deities, such as dancing goddesses and nymphs playing flutes. The temple's exterior is decorated with approximately 1,400 carved marble pillars, each with a unique, highly elaborate design. It is said that it is impossible to count the actual number of the pillars. Each carved statue faces at least one other statue. One particularly beautiful carving was made out of a single marble rock and features 108 snakes and their entwined tails. The white marble pillars appear to change colour throughout the day as they catch and reflect the sun's ray, ranging from golden to light blue. At the end of the 19th century the administration of the temple was handed over to the Anandji Kalyanji Trust who embarked on an 11-year long renovation of the building and its wonderful carvings. They also set up more amenities for the growing numbersof pilgrims and tourists. 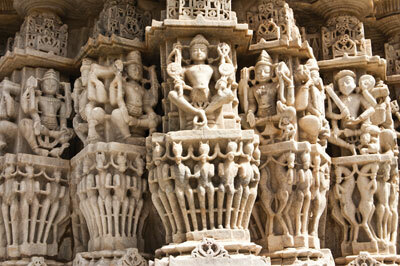 For more information, see: www.ranakpurtemple.com.